Two of the raised treads on the left middle wheel of NASA's Curiosity rover on Mars suffered breaks in early 2017. One of the breaks is visible as a partially detached section at the top of the wheel, seen here by Curiosity's arm-mounted Mars Hand Lens Imager. NASA's Curiosity Mars rover is learning a hard lesson of Red Planet road trips: If you drive long enough, you'll wear out your wheels. That seems to be what's happening to one of Curiosity's six battered aluminum wheels. 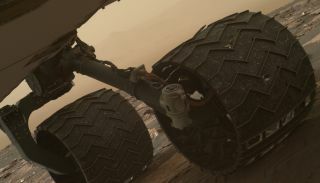 A recent photo check of the rover's left middle wheel revealed two small breaks, NASA officials said Tuesday (March 21). But the rover can still drive on the Martian surface, they added. The breaks were spotted in the wheel's raised treads, known as grousers, on Sunday (March 19), after photos from Curiosity were compared to similar ones from a previous wheel check on Jan. 27. Wheel damage is nothing new for Curiosity; its wheels are pitted with holes and dents from driving over Martian rocks. But the two broken treads are the first sign of deeper wear on the affected wheel. "All six wheels have more than enough working lifespan remaining to get the vehicle to all destinations planned for the mission," Curiosity project manager Jim Erickson, of NASA's Jet Propulsion Laboratory (JPL) in Pasadena, California, said in a statement. "While not unexpected, this damage is the first sign that the left middle wheel is nearing a wheel-wear milestone." NASA engineers began noticing higher rates of dents and holes in Curiosity's wheels in 2013. Since then, NASA has tracked wheel wear on Curiosity and conducted ground-based tests to see just how much damage the rover's wheels can take. "Testing showed that at the point when three grousers on a wheel have broken, that wheel has reached about 60 percent of its useful life," NASA officials wrote in the same statement. Each wheel on Curiosity is about 20 inches (50 centimeters) in diameter and 16 inches (40 cm) wide. They were milled from blocks of solid aluminum, but are superthin; the nontreaded area is about half the thickness of an American dime. Each wheel also has 19 zigzag-shaped treads (the grousers) that bear most of the rover's weight and provide traction for drives. These treads extend about 0.25 inches (0.64 cm) from the skin of each wheel, NASA officials said. Curiosity landed on Mars in August 2012 and has lasted well beyond its initial two-year mission lifetime. So some wear and tear, especially on its wheels, is to be expected, NASA officials added. The rover is currently exploring a region known as Vera Rubin Ridge on a mountain known as Mount Sharp. "This is an expected part of the life cycle of the wheels and, at this point, does not change our current science plans or diminish our chances of studying key transitions in mineralogy higher on Mount Sharp," Ashwin Vasavada of JPL, Curiosity's project scientist, said in the NASA statement. As of Monday (March 20), Curiosity had driven 9.9 miles (16 kilometers) on Mars since its 2012 landing. Mission managers estimate that at least another 3.7 miles (6 km) remain for it to reach the farthest uphill destination on Mount Sharp currently planned. Curiosity achieved its original goal during its first year, when it discovered that the region of Mars it is exploring, a vast area known as Gale Crater, once had the right conditions needed to support microbial life, if life ever existed on Mars.